Boxing is heavily engrained in my DNA. While I cannot punch my way out of the proverbial wet brown paper bag, my dad Len was Royal Engineers middleweight champion either twice or thrice (depending on how many lagers he’d had when recounting the tale) and boxed for the Army against the Navy more than once. All in the1940s. 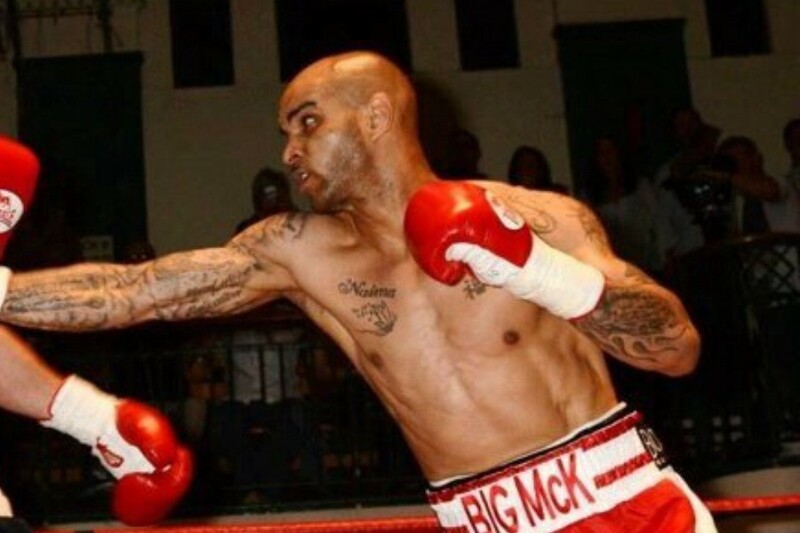 On demob, he trained and sparred at West Ham Baths and boxed at Bethnal Green’s York Hall as an amateur on several undercards to professional bouts. He was offered what seemed to have been a slightly dodgy pro deal and thus turned it down to join the police, a decision I doubt he regretted. Uncle Joe was a painter and decorator who sometime worked for promoter Jack Solomons (as influential a figure then as Barry Hearne is today) and thus often got free tickets to fights at Wembley’s Empire Pool, featuring Henry Cooper, Brian London, Jack Bodell and Terry Downes. Look ’em up. When he died he left me a fantastic batch of programmes, which unfortunately became forever lost on a removal from Blofield to Coltishall. As did a few pieces of my more valuable vinyl. Hey ho. Uncle Albert (not that one) was a merchant seaman (like that one) and a pug as well but his fighting tended to take place in cathouses and bars in South African ports, leading to him spending more time in the brig than the engine room. So, what’s all that got to do with NCFC? Well, plenty actually. I’ll start with Kevin Keelan. Against Northampton in the late 1960s and possibly one of only about three or four matches I attended as a youngster throughout that entire decade he had been barked, boll*cked and bitten throughout the game by their bruiser of a striker – one Tommy Robson. At the point of one elbow too many KK decided he’d had enough of Tommy’s attentions, disregarded the whereabouts of the ball and smacked Robson straight in the kisser. Classily he didn’t wait for the ref’s pointing finger (no actual red cards in those days) and walked straight down the tunnel. Moving on a couple of decades or so, there was an occasion when we signed a certain striker who possessed a model wife, exotic pets and a floppy haircut. He was introduced to one of our other players, who apparently said “I’m the hard man around here. Watch out you flashy individual or it’s this”. ‘This’ meaning a raised fist. Player B said to player A: ‘I don’t like you either – go on then, get it over with’. Before player A could land a telegraphed blow he was decked, thus losing all dressing room credibility and was shipped out of the club shortly afterwards. Player B stayed and contributed a great deal to our cause for quite a while until the advent of the Chase fire sale. He had his own oft-sung song, which player A certainly never did. And then, of course, there was Worthy and Co’s disastrous trip to Fulham for that relegation showdown. Sure, there were rumours about a crazy decision to announce that several playing contracts were not being renewed immediately prior to that journey, but I don’t know if that’s true or not. What I do understand on good authority is that (I’ll go for players C and D this time) is that player C had been paying far too much attention to the wife of player D. That kind of thing happens in all walks of life, not just football, of course. Anyway, a coach is an enclosed environment. Player D was not to be messed with, as player C quickly discovered. Pugilistic action followed and our relegation was completely assured. Before we’d even kicked a ball. Which leads me neatly on to the amazing McKenzie family, with Leon in pole position. An instant NCFC hero (“top of the league at Portman Road”) who quickly got his own song: He scored against the sc*m, he scored another one. We all know it. Leon is the son of British champion Clinton and the nephew of a further British and European champion, the probably better-known Duke. When he quit football for good, he fought several times in the super-middleweight division as a professional boxer. I can only think of Curtis Woodhouse, ex of Sheffield United, who has ever attempted anything similar before. All of us City supporters wished Leon well in his battle against depression when it was disclosed, which I believe (and sincerely hope) he is very much winning to this day. And as for the boxing world of right now, I had the privilege of meeting Cromer’s finest – Liam and Ryan Walsh – at their training base a short while ago. The twins were wonderful, warm and welcoming for a short chat. And if I had to choose three of our players I would definitely not get in the ring with, they would be Iwan, Duncan Forbes and… Craig Bellamy – ha! The inspiration for it came from our very own General Melchett, with whom I had a brief chat on MFW last week which touched heavily on boxing. Many footy fans love the noble art. Thanks, General. Bah! And before the usual suspect (not you Jeff; I actually quite like your comments) appears to tell me I have written unresearched, unsubstantiated, non-citated drivel I will say just this: Neither MFW or myself wish to be done for libel, hence the A, B, C and D references. The tales in the article are to very the best of my knowledge true and told to me by NCFC insiders, privately. I feel honoured! Footballing fistiecuffs and rumoured discord are as old as time. Often impossible to know how much truth there is in any of them. In more recent times we have had all sorts of rumours doing the rounds for players: E, F & G. With E, going awol from a hotel, F getting injured on a boat and Mrs G having a panchant for the wrong bonehead in the team. I have never been close enough to any players at NCFC to get anything too juicy or knowledge of who was which eras hardman (Too often it has felt we were something of a soft touch as a team) But the documentaries about Wimbledons crazy gang were an incredibly entertaining look into dressing room psychology, with even self-styled hardnut Vinnie not going near Fash the bash. I once saw Herbie Hide in Peppermint Park, as a callow 16 year old (That was me not him! and It was PP!) he quite simply looked the scariest dude I had ever seen. By heavy weight standards though he was seen as something of small fry but did exceptionally well to hold a world title beating many bigger guys. The adage that a good bigun beats a good littleun may have truth to it but I’ve seen a few instances in boxing and the wider world that the bigun reliant on perhaps size alone got done by a more skilled, faster but smaller fighter. Sorry to depart topic a little but, On the street it seems to come down to attitude and if anyone has any sort of formal training. This is where I fear for any fans or rival hooligans going to Russia, the Russians are not casuals, after a beer, quick dust up and a laugh down the pub afterwards (Trying not to trivialise it, but it when you look retrospectively, it seemed like playground highjinks next to the Ultras of today), they seem commonly trained in MMA, are carrying weapons and seem hellbent on inflicting maximum damage on anyone not just other Hooligans. Yes the British Hooligan are childs play to their Russian counterparts and as both Martin and I stated yesterday anyone going to this world cup take their life in their own hands. The local police will not intervene until it is all over and the emergency services maybe slow on the call out so that they don’t get dragged into the rumbles. The Irish, Welsh and Scots do not deserve to be so tarnished. I guess it’s fair to say that the other three home nations cause next to no grief when they travel to Europe – even if it is often just for qualifiers. It’s so easy to forget that the keyword here is English over British – I’ve made that error myself so many times in conversation with a Welsh mate and had a verbal slap on the wrist every time! And England do so well with their players from the world’s richest league. OK so it is generally an English problem, but when I was a youngun, I was visiting London on a weekend of a home international vs Scotland. I can tell you that the Scots where very friendly, they were happily trying to share; chairs, fists and no doubt headbutts with their English friends. Local hostilities aside, they do seem to be able to behave the majority of the time, unlike our mob who seem to have a pocket of ejits who tarnish the majorities reputation. Thanks General – I said we’d try and do it if Editor Gary was amenable! Herbie Hide is indeed an interesting character – we used to drive past his house on the way to Ringland Hills to walk the dogs and the array of vehicles parked outside was showbizzy to the extreme. Quite how he stands with HMRC these days is not to my knowledge and certainly none of my business. There were quite a few more apocryphal tales I could have related, but chose to stick to those from what I know to be good sources. As you say you have to believe the credible. Your comment about player F and the “boat incident” is one I also believe to have foundation in truth but I didn’t include it in the article as it was just pub gossip to me at the time. Although on a truth to fiction basis I’d rate it 9:1 and “evidence” suggests it happened. Career ending as well, which was probably the purpose of the aggressor. Another spat over somebody else’s lady, of course. btw Gary is always open to a Guest Blog – if you fancy it give him a shout. He’s right Melchy … there’s a guest blog slot here with your name on it! I’ll give it some thought and if a topic comes to mind I could run it past you. A very good read and some great name being recalled. Living up north for the last 39 years you get to hear a lot of boxing stories and on a few occasions I have met Brian London who use to live in the Stanley Park area of Blackpool, walking his dogs or just out jogging round Stanley Park – always pleasant till you mention the Cooper brothers, as they both, at one time or another, beat him to the British title so I understand. Growing up in Great Yarmouth we had the Kingfisher Gym and there were 3 brothers that fought as amateurs and at least 2 joined the RAF and were combined service champions. It seems as you mentioned boxing and football go hand in hand and I suppose that can go back to the grassroots of both sports. Anyway, tales from City’s crypt are always fun to hear and all clubs will have similar takes that they try and keep quiet about. While living in Barnsley there were stories about 2 players trying to sleep with the manager’s wife and he was once the hardman at Leeds and would bite your legs – the same 2 players didn’t stay there very long. I never met Henry or brother (George?) but I did meet his manager Jim Wicks thanks to Dad. As an eight-year old at that time I have no real recollection of it at all but I do know he came to our house – and he gave Dad a signed glove. I would love to know what happened to the glove as I don’t have it. I’ve still got a couple of pics of Dad in his “Kray Bros” gloves-up pose – he was a contemporary of theirs in the same part of the world. From what he told me neither Reg or Ron would ever have made pro but boxing was just what many East End boys did in those days. Being a straight-ish (never averse to a gifted bottle of Scotch or two in the pocket after a ship inspection) PLA dock Copper, I doubt Dad ever spoke with either of the younger Krays. Put it this way, he’d never answer that question when I asked it. Not even at the end. I guess he’d probably come across a few of their associates though – he was based at West India Dock and had to take anyone arrested to the Met’s Limehouse nick to get them charged! It’s a shame that Boxing is no longer in the forefront of sport in the way it used to be. Growing up in the 60’s & 70’s the FA Cup Final and World title fights were great occasions where the family would sit in front of the box or the radio. I can still remember those times today and wish the pure emotion they emitted could be re-created. If you remember boxing on the radio the inter-round summariser was one, Fred Verlander, well, back in the mid 70’s I was fortunate enough to get to know Fred and chat with him. So many boxing stories, Henry Cooper, Brian London and many others, great man Fred. I have an inside story from some years back of two Arsenal players involving a matter of the heart and fisticuffs, both x internationals, I guess similar accounts would be true over the years in all clubs. Meanwhile, I’ll add Gary & Grant Holt to your list Martin. Bugner stood up, took all Henry could chuck at him and somehow came away with a points decision. Which set the map for his career, really. Stand there, take it, don’t go forward and hope the judges cards stack up. Joe Bugner was not one of my favourite fighters – but of course the boxing world needs all types and all styles. Forget the Frank Bruno staged stuff, HC was an afficianado of the sport and a great commentator I enjoyed listening to as well. The action in the ring can be frantic and to observe and disect it the way he did was truly admirable. My first boxing memory was watching the Clay (as he was then) Liston rematch in Grandma’s rented hovel in Forest Gate at stupid o’clock in the morning. Special broadcast. 1964-5? I grew to love Muhammad Ali, Sugar Ray Leonard and later Nigel Benn – I know, not in the same bracket as the others but he lived near me and I once met him. Top man. We must be around the same age, that’s my first boxing memory and West Ham v PNE my first Cup Final memory, I was 8 in 1964 Clay and Liston fought twice, in 64 & 65. You are bang on about money and showbiz I rarely watch football on TV now opting for radio 5 instead and can’t deal with VAR. There was nothing quite like listening to boxing on the radio trying to stay awake, somehow you felt the whole nation watched. In the end less becomes more and those ‘clever’ marketing people will catch on again one day. “Know what I mean Harry”. Yes. I was born in late 57 (I share a birthdate with Jimi Hendrix) so obviously I’m just now 60. My entire family were rabid Hammers so I remember that match slightly more than I otherwise might. Even aged seven I realised something wasn’t quite right with Uncle Joe when he eventually got back from Wembley – he couldn’t stand up and managed to pull a fully-loaded plate rack off the scullery wall. Grandma used words an elderly lady really shouldn’t – “you’ll pay for those you drunken b******” being one phrase I genuinely remember. God knows what he would have been like if West Ham had lost! A certain Jim Standen became fixed in my mind that day. I was 8 played in goal but cricket mad, (nick name Fred after Freddie Truman) and Standen was Hammers keeper and played County Cricket! Those were the days! 20/20 at Carrow Road this Summer then? Reckon Uncle Joe must have eaten something dodgy then, Barley ,hops, water and yeast, funny old food when mixed !! Ha! I remember Jim Standen too – and the B-boys as in Bovington, Brabrook, our very own Kenny Brown and others I’ve long forgotten. The Hammers never appealed to me for some strange reason and I genuinely don’t know why. My abiding memory of Joey was one evening when he came home very late from work completely newted and threw his proferred tea of pork chop, understandably congealed veg and gravy and slung the lot in the fireplace, plate, cutlery and all complete with derogatory expletives directed at my Grandma. God I was a spoiled child. Never been a huge fan of boxing myself ?